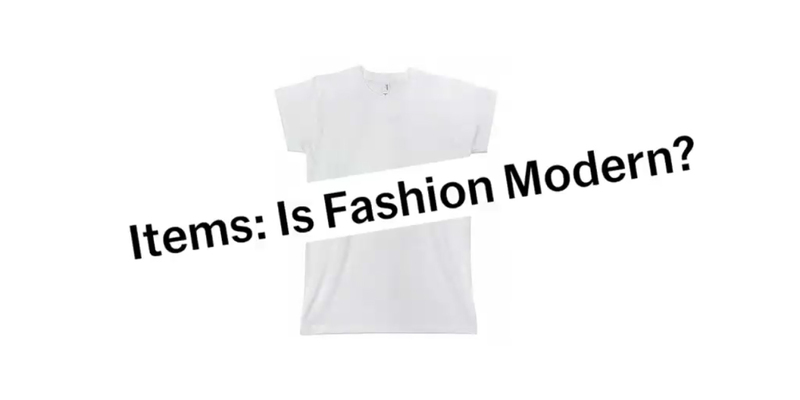 Accurat - Items: Is Fashion Modern? 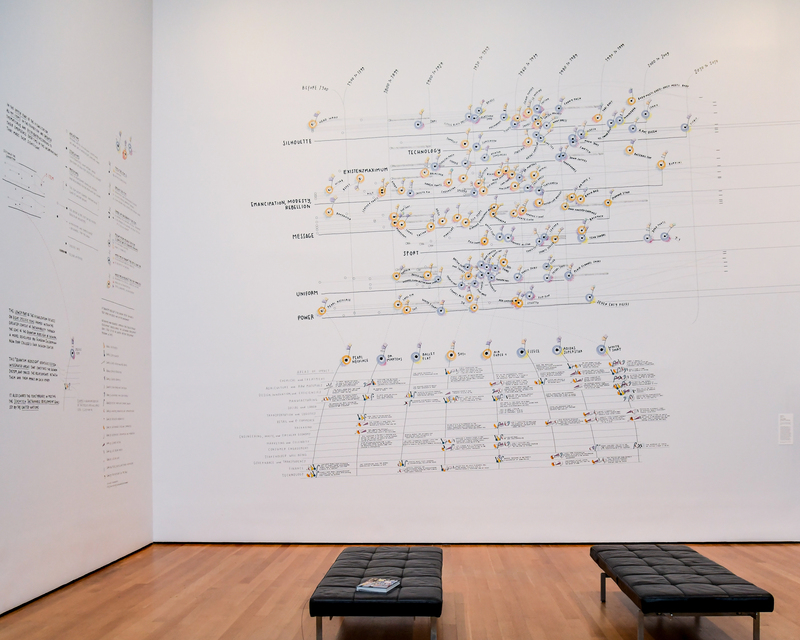 For MoMA, we turned a vast and unstructured pool of quantitative and qualitative cultural data into a piece of visual art, that also doubles as a data-driven experiential guide to an innovative exhibition on fashion. 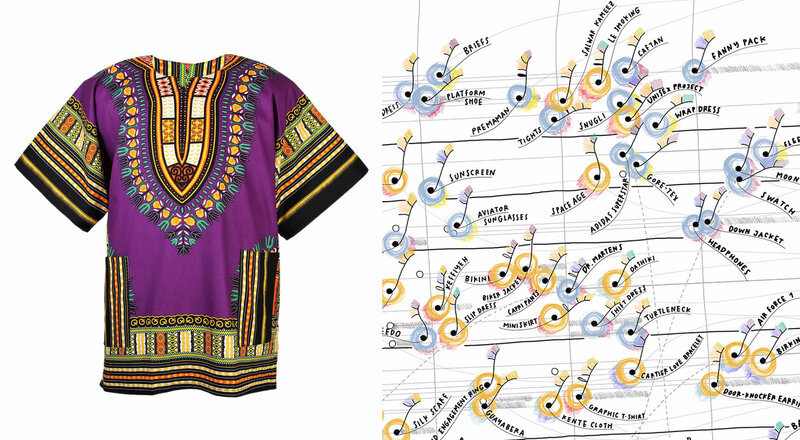 In the Summer of 2017, we have had the huge honor of being asked by Paola Antonelli and Michelle Millar Fisher — respectively Senior Curator and a Curatorial Assistant in MoMA’s Department of Architecture and Design — to imagine and realize a data-driven artwork that could encapsulate both the manifest and the invisible themes underpinning their newest exhibition on fashion at MoMA, called Items: Is Fashion Modern?↗ Opening on October 1, 2017, the show explores the present, past — and sometimes the future — of 111 items of clothing and accessories↗ that have had a strong impact on the world in the 20th and 21st centuries, and continue to hold currency today. Among them are pieces as well-known and transformative as the Levi’s 501s, the Breton shirt, and the Little Black Dress, and as ancient and culturally charged as the sari, the pearl necklace, the kippah, and the keffiyeh. 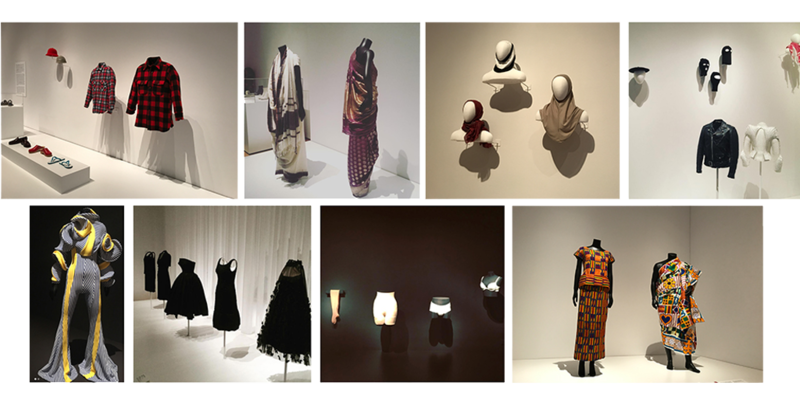 For Items, Accurat investigated the hidden stories of these iconic objects, digging for quantitative and qualitative information that could help paint a picture of the fashion landscape through data, and capture the inspiration, themes, and ideas that guided the curatorial process. 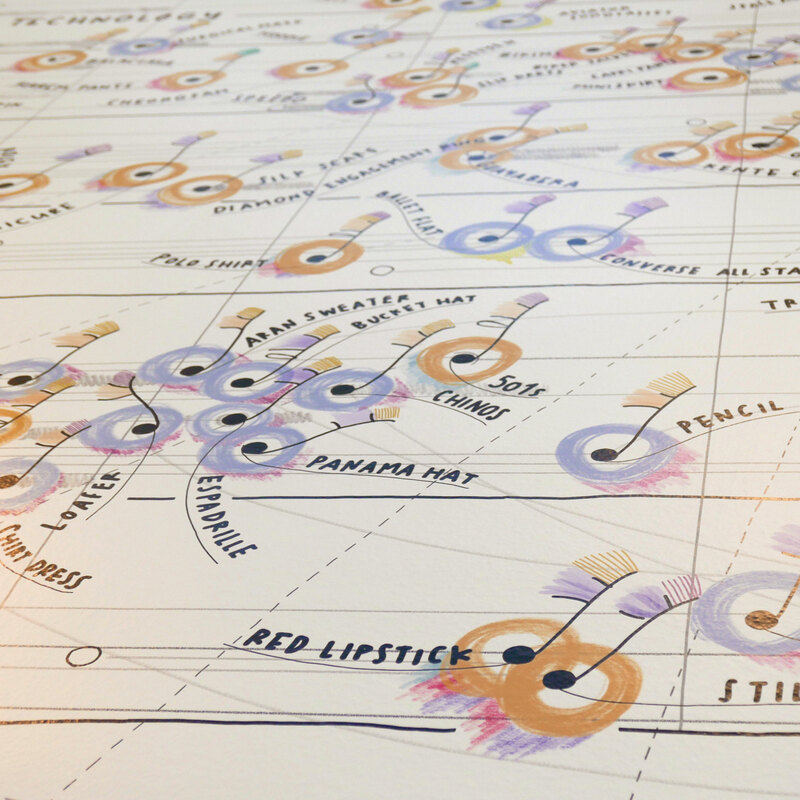 The result of this research and discovery process is translated into visuals in a site-specific hand-drawn visualization that explores the explicit and implicit features of the items, both individually and as part of a bigger ecosystem. 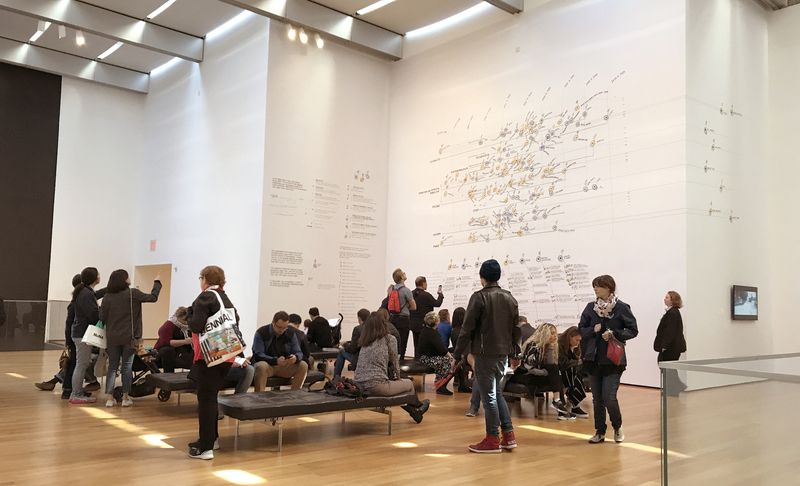 The visualization is magnificently displayed as a closing piece to the exhibition, printed at large scale over three huge 20-foot-high walls in the sixth floor lobby of the original MoMA building on 53rd street, towering over the visitors just as they alight from the escalators. Did you know that the Dashiki is not a traditional West African garment but it is instead a mass-produced modern garment emerged in New York City in the 60’s? As the exhibition text highlights, “born in 1967 out of the vision of young urban professionals Jason and Mabel Benning, shoe designer Howard Davis, and a handful of their friends who started the brand “New Breed Clothing” in Harlem, the Dashiki provided the sartorial backdrop for the natural Afros and raised fists of the Black Power movement in the 1960s and early 1970s. Benning and Davis saw their mission as “to uplift the black man by working toward economic independence and developing pride in his heritage. 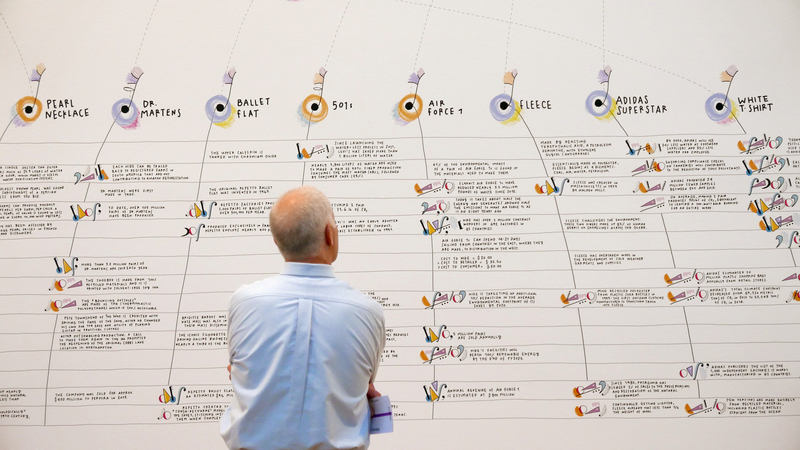 - The Landscape depicts all of the 111 items and provides both an overview of the structure of show and a visual access to the stories and characteristics of each of the pieces exhibited. Just because you don’t immediately see numbers, it doesn’t mean there is no data to identify, collect, organize, process and analyze. We needed to build our own dataset: we dug deep into the stories of the 111 items and in the documentation of the background research conducted by the curatorial team and we conceived a set of questions that we used as a base to analyze each element of the collection and categorize them according to multiple overlapping criteria: Why was each of the items included in the show? 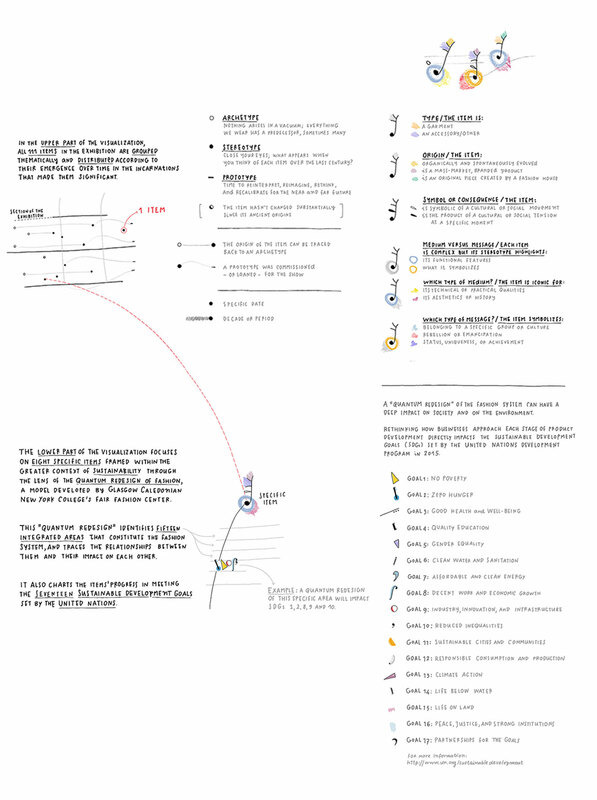 What can we understand of the principles that guided the curatorial process by looking at this pool of unstructured and highly qualitative data? 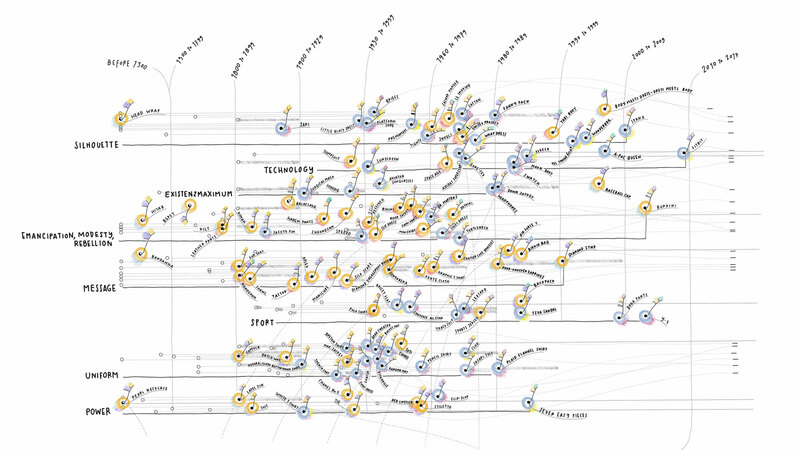 And ultimately, how can a visualization of this data enrich the experience for the audience? In the first level, the Landscape, we provide a background and texture for the visual narration. 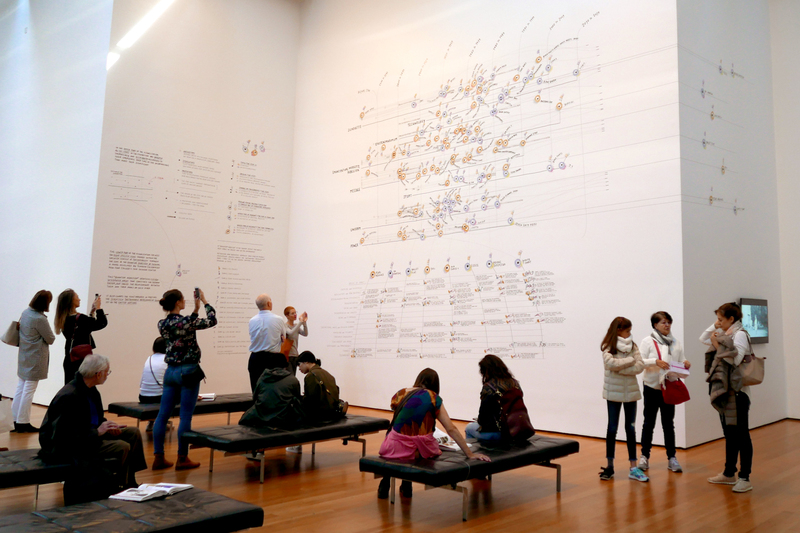 This level of information reveals what we discovered about the hidden connections and patterns that guided the curatorial process and flow of the show depicting the 111 objects through their intrinsic meanings. 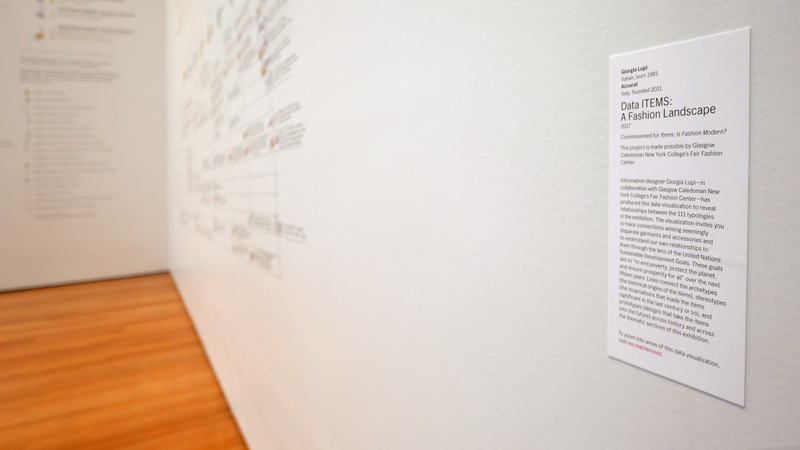 The 111 items are distributed on the wall according to their emergence over time in the incarnations that made them significant and are grouped according to the exhibition’s interplaying narratives, analyzed and depicted through the use of graphic symbols the intrinsic features that make them unique and influential. Eight of these items then become Capstones in the visualization, eight symbols we used to bring the attention to how fashion impacts our world at a scale that is often overlooked. 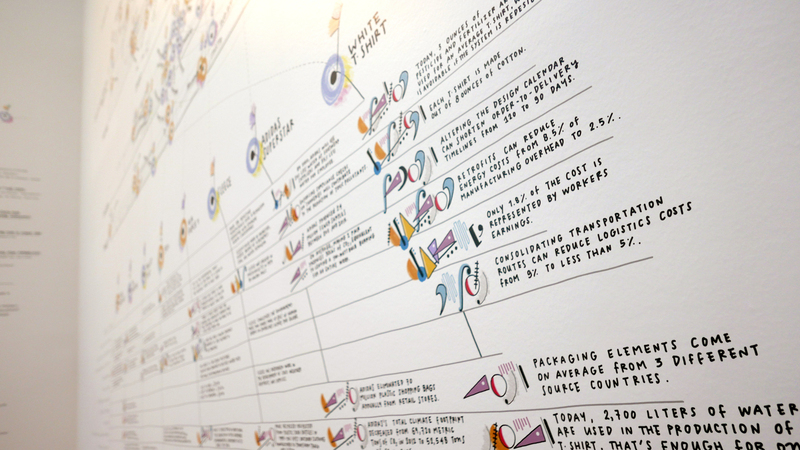 The entire lifecycle of a fashion item often involves tens of industries and sectors, from agriculture to retail, from transportation to finance; we used the stories of these very specific products to provide a glimpse of all the human lives touched by a garment or an accessory before we wear it. It has been an exercise in exploring and depicting the richness and depth of soft data. Many of our most recent projects try to explore how we can adopt a broader definition of data, encompassing also the more subjective, intimate, personal and therefore imperfect aspects of the information systems that we live in. When working with data, so often we tend to focus only on the hard numbers that are readily available to us, without realizing they can actually become much more meaningful if we are able to unearth a more nuanced and expressive type of data along with them. Enriching hard data by combining it with an additional layer of “softer” and more qualitative information is in many situations a successful strategy to provide a very much needed context, that helps decoding and interpreting the most complex and multifaceted scenarios. You can follow us on Twitter, Instagram, Facebook, Medium.